Navodaya Education Trust ® is a testimony of dreams associated to our national goals. Born in a time when education was reckoned service, the trust aims to bring social and economic change through the proactive personal development of every student that come into its fold. The vision of Shri.S.R.Reddy (Founder and Chairman, Navodaya Education Trust) made the trust grew from a single institution into mammoth multi-institutions delivering quality education at all levels. Today Navodaya Education Trust ® owns and manages over 15 institutions, from primary to post-graduation. It comprises Medical, Dental, Engineering, Pharmacy, Nursing, Physiotherapy, college of education, public school and paramedical institutions. 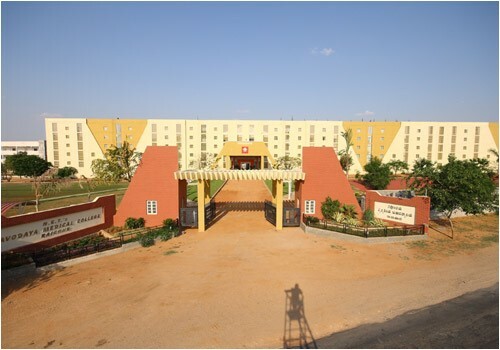 Popularly known as the Navodaya Group of Institutions, this education major has set a hall mark standard in professional education sector which allows it to redefine its own standards consistently. The penchant and prolific education are the hallmark factors drawing students across the globe. The plethora of resources unified with excellent talents makes Navodaya an ideal learning ambience.